Life is too tasteless without peers who share the similar weirdness and madness as you, no matter how distant they’re, they shall always remain closer to you! That’s the magic of having friends. This August, The Culinary Lounge has dedicated the month to friends and all the sweet lovely nostalgic memories that follow suit. Isn’t that pretty exciting? Well, if you are looking for some fun under the sun in an unconventional way, this is it. #YaariCookOff Challenge is definitely a unique idea and a fun way to cherish your special bond. Over cooking and scrumptious dishes. Yes, you heard us right! The challenge will feature 6 teams with 3 buddies in each team who will be given a task to cook dishes in a stipulated period of time, as per the Chef’s strategy. The best dish and team work will win some exciting prize. But, hey, it doesn’t end here, in all the spilling, whipping and multi-tasking, we’re sure you will experience gags, laughs and discover a new side to your peers. The very thought of this fascinating idea alone leaves us gaping in awe. 6 teams, 24 friends, 2 hours, over a thousand happy memories and endless fun! Come together to celebrate the friendship month with a difference. 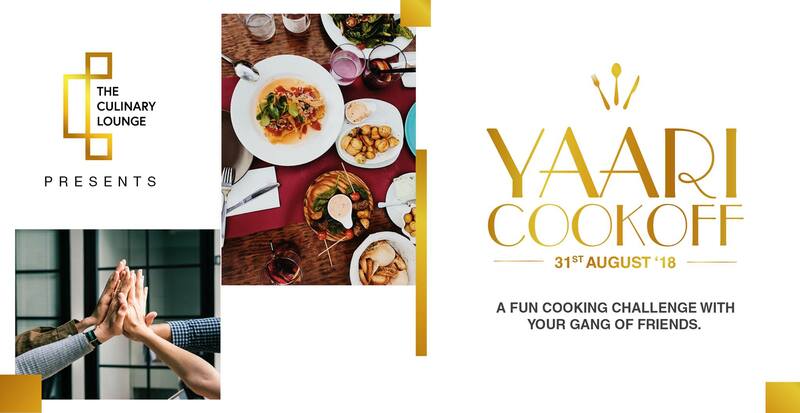 #YaariCookOff Challenge will be taking place on the 31st August’18 at The Culinary Lounge, Hyderabad.